Judith Handmade Treasures: Sunday at Home! The rain has stop and our pond is full. It really feels like fall now here at the back 40. I also manage to get some wash done and have the last load in the dryer. With all the rain yesterday, I did not leave the house. In my pj's all day long and manage a shower sometime in the afternoon. Here is what I was working on yesterday up in my office. Added a border to the beginner's quilt. 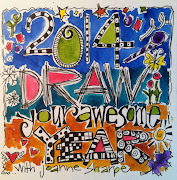 Have not decided to added another border. 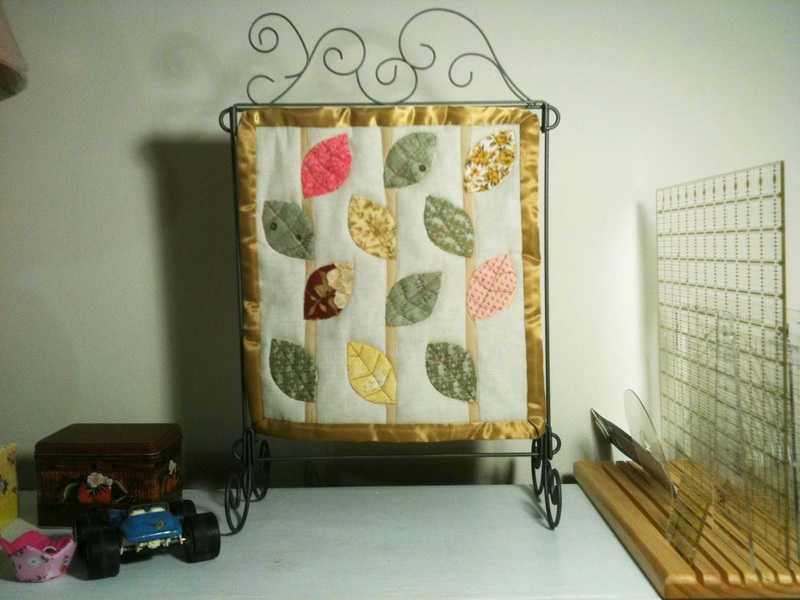 Sew Sweet 12" x 12"
My table stand is full with a leaf pattern from Julie Comstock over at Cosmo Cricket. She particpated in the Moda Designers Blog Hop. 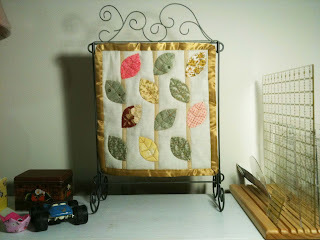 I just love the pattern and applique the leafs. A simple pattern for someone who does not applique that much. If you are interested in the pattern, visit Julie for her pattern or Moda, The Cutting Table with a list of all the designers. 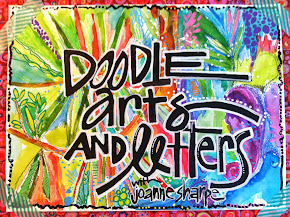 A few blog hop starting tomorrow. Cherry from Cherry Blossms Quilting Studio is hosting Leafs me Happy. Click here for a schedule. 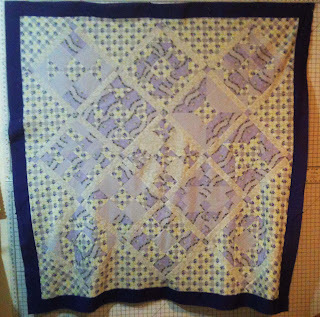 Here is a new one to me: bloggers Bar Hopping Quilt Along from Blue Nickel Studios. A view of what I am working on. Does the pattern looks familiar. I had a notion to make a lap quilt. Halloween is my favorite time of the year. Great Granny pattern from Bee In My Bonnet. 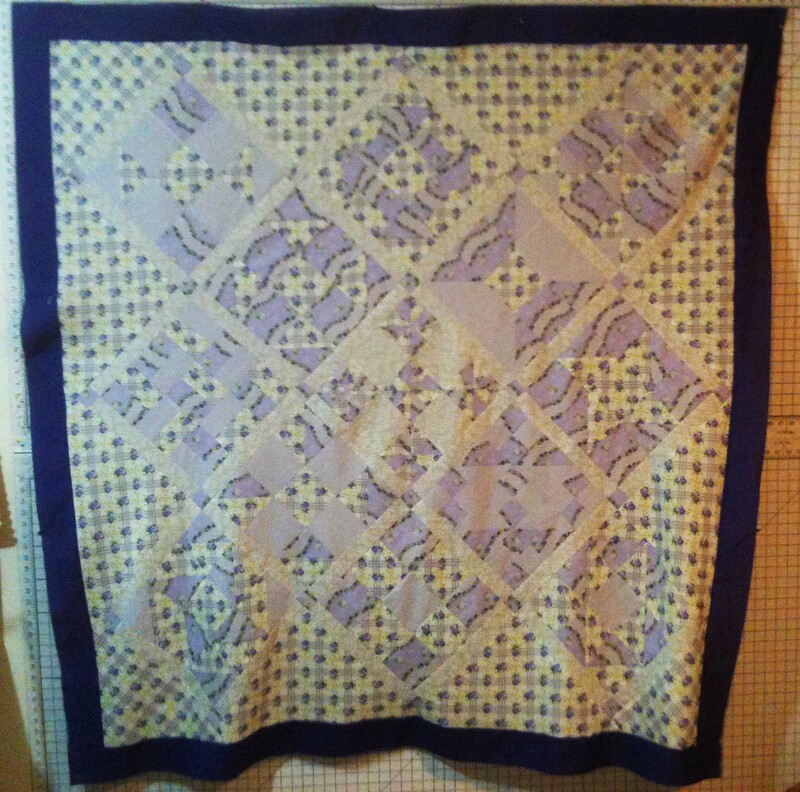 I have not finished my other quilt, but I thought I would do both at the same time. See how that goes. I also have other projects I am working on that I will preview in November.